But now scientists at the University of California, Berkeley have found a shortcut: a printer that can fabricate objects in one shot using light — and which could, potentially, revolutionize rapid manufacturing technology. It works more like a computed tomography (CT) scan than a conventional 3D printer. 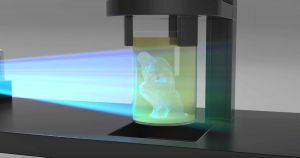 It builds a 3D image by scanning an object from multiple angles, then projects it into a tube of synthetic resin that solidifies when exposed to certain intensities of light. In two minutes, for instance, the team was able to fabricate a tiny figurine of Auguste Rodin’s famous “The Thinker” statue. But it’s an exciting new technology — and one that could lead to a “Star Trek” future.